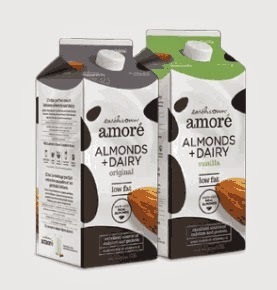 Amoré Almond + Dairy Beverage combines the goodness of dairy with the creamy, nutty taste of real roasted almonds. It is a healthy everyday pleasure to boost your daily milk intake. It is an excellent source of calcium, protein, Vitamin D, Vitamin B12 and riboflavin. In fact, Amoré contains 50 per cent more calcium per serving than milk! Chris loves drinking it in the morning as an alternative to straight milk. I enjoy putting it in my coffee for an extra flavour boast. The Vanilla flavour tastes like a healthy vanilla milkshake! Amoré can be used anywhere you would use milk - on cereal, to cook with - always adding extra flavour. Would you like a sip? Check out the Where to Buy tab on Amore's Facebook page to find a store near you. Disclosure: I received Amoré Almond + Dairy Beverage for the purpose of this review. As always, all opinions on this blog are my own. I have used the vanilla in protein breakfast smoothies that I make for my daughter and I. It does add a nice flavour to shakes doesn't it? My daughter loves the chocolate of course. Thank you for this great review!